Welcome to the newest veterinary center in Roswell, NM! We have a fantastic staff with decades of animal care experience. Nathan Wenner DVM is proud to offer exceptional veterinary service to the pets of Chaves County! We invite you to come take a tour of our facility and meet the amazing team! We have a well equipped building and staff so we can accommodate appointments and walk ins everyday! Our team is prepared to take care of all your household pets and their various veterinary needs. 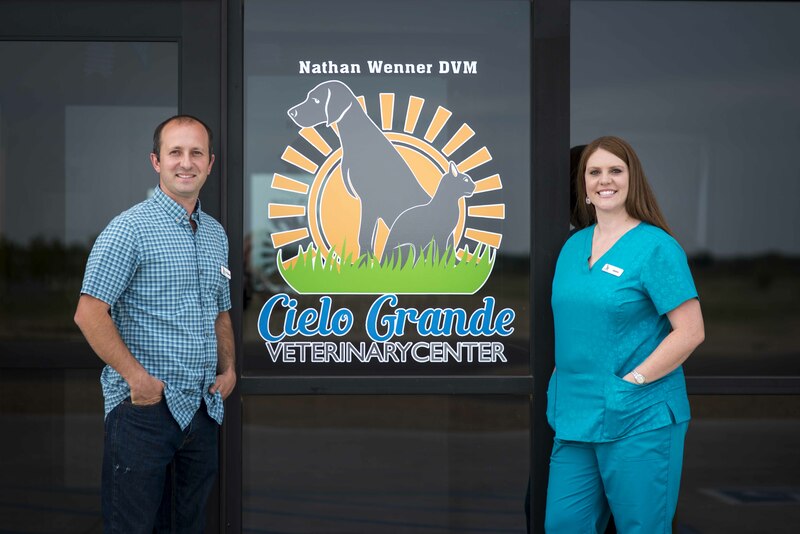 Cielo Grande Veterinary Center is locally owned by Nathan and Jalene who are Roswell natives, so we treat all our patients like friends! We look forward to meeting your family soon! "Dr. Wenner has always gone above and beyond for the care of our family's pets for several years. We are excited to take our pets to the new building!" "Dr. Wenner takes great care of our cats and is always happy to help us whether it is a complicated or simple matter. The staff is always helpful and friendly!" "I want to thank you guys for your great hospitality and assistance. I brought in my dog to be seen by Dr. Wenner after he had been neutered at another clinic. Dr. Wenner was very nice and answered all questions that I had; he put my mind at ease! Not only did you guys squeeze me in to your already full day of appointments, but after seeing my dog, Dr. Wenner gave me a tour of the entire facility! Thank you so much for all of your help! I am happy we have finally found such a wonderful and trustworthy place to bring our fur babies!"